What's the impact of TPR's 2019 annual funding statement? This year’s annual funding statement (AFS) has seen The Pensions Regulator (TPR) become more prescriptive and start segmenting schemes into different risk categories. 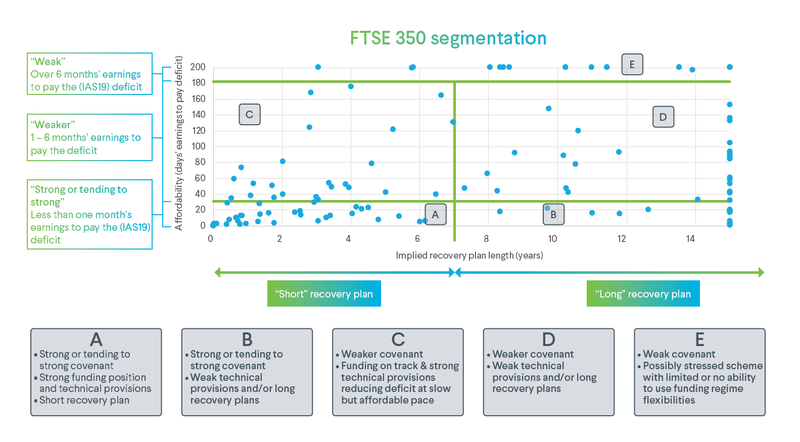 There is a new recovery plan length segmentation of shorter and longer than 7 years, suggesting that recovery plans longer than 7 years are likely to attract scrutiny. What does this mean for employers and trustees and how should they be planning for forthcoming valuations? The chart below plots the FTSE350 into the above 5 buckets. We’ve considered the days of corporate earnings required to pay off the IAS19 pension deficit as a crude measure for covenant strength. And for the recovery plan we’ve considered the numbers of years of current contributions it would take to pay off the IAS19 deficit. Click here to view a pdf version of the chart below. Most of the FTSE350 is already in a good place. 59% of the FTSE350 are in category A, if schemes in an IAS19 surplus are included in this category. Companies with longer recovery plans are paying a lower proportion of their corporate earnings into their pension schemes. However, there should be capacity for them to pay more and shorten recovery plans. For example, companies in category D are only paying 12 days of corporate earnings into their schemes, compared to their counterparts in category C paying 23 days of earnings. The same pattern is seen for the stronger covenants, with companies in category B only paying 4 days of earnings into their scheme, compared to 15 days in category A. Weak companies are already paying a significant proportion of earnings into their pension schemes. As a result, there is probably limited capacity for them to pay more. For example, companies in category E are already paying an average of 58 days of earnings into their pension scheme. How should employers and trustees respond? Set an appropriate long-term objective for your scheme. Whilst aiming for insurance buy-out ultimately removes the scheme from your balance sheet, it may be more expensive than running off the scheme using a cashflow driven investment strategy to reduce volatility. Is it better to take more investment risk to reach a higher funding target, or take a lower level of investment risk that may be more supportable by the covenant to reach a lower funding target? Quantify the level of downside investment risk in the scheme, and evidence that this is supportable by the covenant. If it is not, ensure plans are put in place to take less investment risk, either immediately, over time or as the funding improves. Consider the size of deficit contributions relative to the size of corporate dividend payments. A significant disjoint between these two items will attract regulatory intervention if the scheme is poorly funded. Put contingency plans in place if cash contributions are constrained. For example, agreeing additional contributions that are contingent on funding getting too far behind plan, or providing non-cash support like security to the scheme. Consider the newly emerging opportunities to get a clean break from your DB scheme at a lower cost than insurance buy-out with the commercial consolidators that are now in the pensions market. According to our research, almost half of trustees believe that keeping on top of regulatory requirements will be their biggest challenge over the next 12 months. With this in mind, we encourage you to take action now.